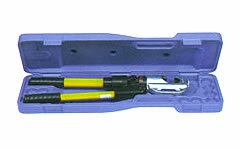 EP-431 Hydraulic Compression Tools: Izumi Products. The EP-431 is unique in that it has a large jaw opening of 31mm, and is able to splice 31mm outer diameter conductors. 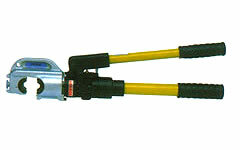 This tool was designed for the electrical contractor and electrical utility lineman who is confronted with larger cable diameter and larger cable connectors. Most internal hydraulic components are the same as the EP-410 and the EP-510B." This tool will be supplied as an insulated version unless otherwise requested on ordering. Accepts all dies used for Alcoa, Burndy, T&B and Blackburn 12 ton Compressors.